Preface; Foreword; 1. Introduction; 2. Waring's problem: history; 3. Weyl's inequality and Hua's inequality; 4. Waring's problem: the asymptotic formula; 5. Waring's problem: the singular series; 6. The singular series continued; 7. The equation C1xk1 +...+ Csxks=N; 8. The equation C1xk1 +...+ Csxks=0; 9. Waring's problem: the number G (k); 10. The equation C1xk1 +...+ Csxks=0 again; 11. General homoogeneous equations: Birch's theorem; 12. The geometry of numbers; 13. cubic forms; 14. Cubic forms: bilinear equations; 15. Cubic forms: minor arcs and major arcs; 16. Cubic forms: the singular integral; 17. Cubic forms: the singular series; 18. Cubic forms: the p-adic problem; 19. Homogeneous equations of higher degree; 20. 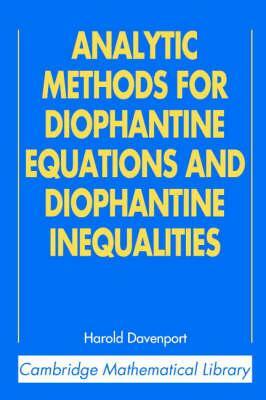 A Diophantine inequality; Bibliography; Index. "Analytic Methods stands on its own as yet another great example of Davenport's style and ability to present a number theory topic. Moreover, the new edition of his lecture notes include a foreword written by three experts...where the recent discoveries and state of the art on the topics covered in the book are summarized, adding a great amount to the total value of the volume."